NEW DELHI, India (CNN) -- U.S. Secretary of State Hillary Clinton praised India's efforts to reduce carbon emissions Sunday, but India's environment minister said the country won't agree to "legally binding" limits on greenhouse gases. 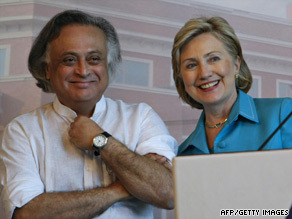 Indian Environment Minister Jairam Ramesh stands with Secretary of State Hillary Clinton on Sunday in Gurgaon. Clinton toured the ITC Green Center in Gurgaon, outside the Indian capital, with Environment Minister Jairam Ramesh, and she praised India's efforts to boost cleaner energy. She called the center a "monument to the future" and said the United States and India can work together to reduce industrial emissions blamed for an increase in global temperatures. "The United States and India can devise a plan that will dramatically change the way we produce, consume and conserve energy, and in the process spark an explosion of new investment and millions of jobs," Clinton said. India's economy is growing at about 8 percent per year, a boom that has lifted a growing slice of its roughly 1 billion people out of poverty, and the nation has objected to calls for strict limits on carbon emissions. India was among the emerging economies that agreed earlier this month to work toward limiting global warming to 2 degrees Celsius (3.6 degrees Fahrenheit), and Ramesh took issue with suggestions that his government was "running away" from that commitment. However, he added, "We are simply not in a position to take on legally binding emissions reduction targets." India is not "oblivious to our responsibility," and is already working on reducing its carbon emissions, Ramesh said. He agreed with Clinton that Washington and New Delhi can come together on steps to reduce greenhouse gases. Clinton said the United States won't do anything to limit India's economic progress, but "we believe there is a way to eradicate poverty while still lowering the carbon footprint." The Group of Eight industrial powers -- the United States, Canada, Britain, France, Italy, Germany, Russia and Japan -- agreed to a target of reducing their carbon dioxide emissions by 80 percent by the year 2050. But efforts to reduce greenhouse gases are a sticking point with developing economies like India and China, where living standards have increased rapidly over the past 20 years. Clinton is on a weeklong trip to India and Thailand.